A quick write-up of the opening hours of this year’s Bloodstock, just to get all you late arrivals (you are all coming tomorrow, yes?) jealous of what you missed. Unfortunately, due mainly to the ground in the campsite being rather dry and therefore quite difficult to hammer cheap tent pegs into, we missed Hundred Year Old Man and Fire Red Empress, though our photographer (Mr Larkin of this shire) did manage to get some shots. Skiltron, though, were a superb start to the festival for us. The Argentinian folk metallers played to a packed Sophie stage and I don’t think that’s just because of people escaping the sudden brief downpour! In fact several folk remained outside the tent, dancing arm in arm to the band’s bouncing, catchy, bagpipe-led rhythms. This wasn’t the first time I’d seen them but was definitely the best performance I’ve witnessed. 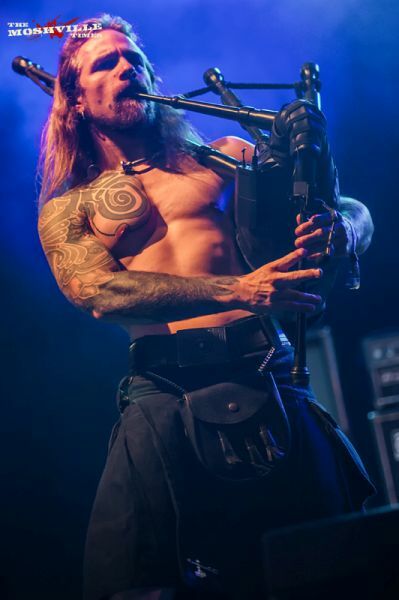 Sean adds: power/folk metallers Skiltron waste no time reminding us of home with their bagpipe-led anthem “Lion Rampant”. The Sophie Lancaster tent is packed and a good portion of the crowd clap along and cheer as the band continue with hits like “Bagpipes of War”. The audience still appear to be warming up, and more fans are still arriving resulting in a diminished reaction. In-house favourites Bloodshot Dawn followed and played a much heavier set, mixing thrash with death and a teeny bit of groove – and a Gojira cover. No opening day nerves for this bunch who had a very impressive circle pit at their command. Of course, they’re old hands at this sort of thing with it being their fourth appearance at Bloodstock, having first played as M2tM winners in 2009. 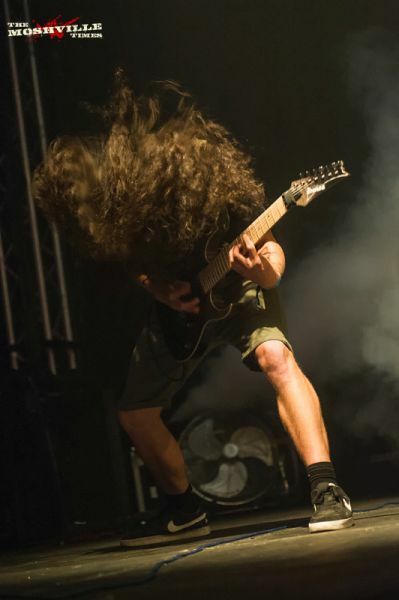 Sean: Returning to Bloodstock for the 4th time, Bloodshot Dawn bring their brand of crushing metal to the Sophie stage. The initial sound is a little sketchy with the triggered kick drums overpowering everything, however the sound balances out over the performance. The set is varied with tracks from throughout Bloodshot Dawn’s career, though new numbers like “Shackled” and the title track to their latest album, Reanimation, go down a storm. The crowd are more animated with more fists rising and frontman Josh McMorran shares some banter with them, inviting them for a drink should anyone run into the band over the weekend. 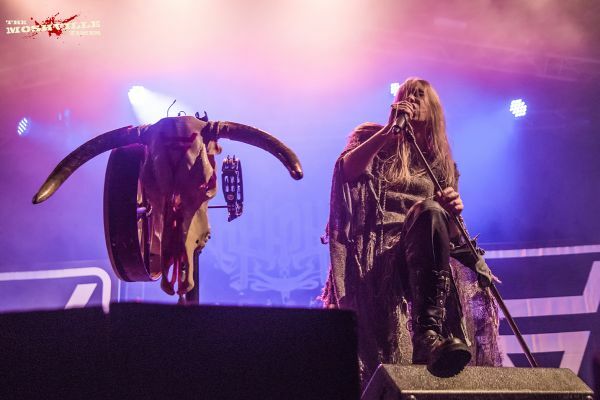 Headlining were Russian folk metal crew Arkona who I first saw four years ago on tour with Eluveitie and Skalmold. They have grown in stature, ability and stage presence in that time – not bad in 2014, very much better now. Maria’s vocals are simply incredible, transitioning from impressive growls to beautiful clean notes with such swiftness it was hard to believe there was only one singer on stage. People near me were headbanging in groups with their arms around each other, having a great time. Worth headliners. So only a small selection of bands covered, but as always a good start to what will be a great weekend in the metal calendar. My festival t-shirt is already purchased and we have a large number of interviews lined up between tomorrow and Sunday. Here’s hoping the weather is our friend and we can enjoy another cracking three days here at Catton Hall. I’ve already bumped into more friends in a couple of hours than I ever do wandering around at home. It’s the Bloodstock effect!